Knickernappies Holiday Gift Guide 3 of 10, Green Gifts & Giveaways Galore! Day THREE of our Holiday Gift Guide w/ daily giveaways! So far we've chosen four lucky winners and there are plenty more opportunities to come. We hope you've been enjoying our gift suggestions and have been checking out our retailer sponsors sites! Today we've got three more great gift ideas and giveaways, let's get this show on the road! WhooWhoo! Designer Print Planetwise Wetbags from GoGoNatural! 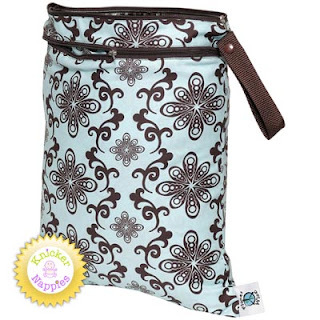 In my opinion there's no question about it, a wetbag is a must have accessory for any cloth diapering mom. The problem, few actually take the plunge and invest in a quality one. That's why Planetwise wetbags from GoGoNatural will make the perfect gift for that cloth diapering friend or family member on your shopping list! "Planet Wise Wet / Dry Bag, a truly innovative bag that allows you to carry your wet and dry items in the same bag. Each bag contains a "wet" section that is sewn and sealed for no wicking or leaking AND a zippered dry section along with a clever snap handle for easy carrying. Carry all your items in one bag while keeping your dry items dry and your wet or soiled items separate. Truly an all in one bag!" Stay connected with GoGoNatural by becoming a Fan on FaceBook! A Mama is Born Gift Set from Ecological Babies! I'm sure that more than one of us are shopping for an expecting mom. So often all gifts revolve around one thing, the baby! Don't forget that the mama to be needs a little pampering too! The Mama is Born Gift Set from Ecological Babies makes a perfect gift! Treat that pregnant woman like the goddess she is. This is a perfect collection of bath and belly products to take her through the next nine months. Collection comes in a reusable muslin pouch! If you love Ecological Babies then you should become a Fan on FaceBook and then you'll be kept in the loop whenever they have a sale or important announcement! Tiny Revolutionary Onesie from GreenPixieBaby! This Tiny Revolutionary Onesie has seriously got to be one of the cutest onesies ever! I want one and I don't even have any more babies who fit into onesies. If you have a little cutie in your life then this is the perfect gift for them! "Our best-selling design for babies! Printed on 100% pima cotton onesie using our non-phthalate water-based inks. No shrinkage - very high end hand feel. 2T is in a T-shirt style. This message of hope and love is printed on our amazing new Eco-Tee which is made from an earth friendly mixture of ORGANIC COTTON, RECYCLED POLYESTER RAYON mined from the CELL WALLS OF PLANTS. It's washed using biodegradable detergents and softeners and the super cool light gray heather finish is achieved using non-toxic dyes." Fan GreenPixieBaby on FaceBook and you'll be the first to know when they add more adorable items like this trendy little onesie! *Each day of the Holiday Gift Guide we'll have a 24 hour Giveaway. You have until 12am EST the following day to enter. Today's Prizes: Two winners will be chosen. (1) Winner will receive a $20.00 Gift Certificate to GoGoNatural and (1) Winner will receive a $25.00 Gift Certificate to Ecological Babies Boutique! (1 entry) Follow GoGoNatural on FaceBook and comment on their wall to say hello and verify that you indeed became or already are a Fan. (1 entry)Follow Ecological Babies on FaceBook and comment on their wall to say hello and verify that you indeed became or already are a Fan. (1 entry)Visit GoGoNatural and comment here with one other item you'd like to purchase from them besides the featured Gift Guide item. (1 entry)Visit Ecological Babies and comment here with one other item you'd like to purchase from them besides the featured Gift Guide item. *Reminder, you have until 12am EST on Dec 17th to enter this giveaway and then 48 hours to claim your prize if you do win. Check back daily because we'll be having giveaways on our Gift Guide every day until December 24th! Good Luck! New fan of GoGo Natural on FB! I'd like to buy a fuzzibunz diaper from gogo. i like gogo natural on facebook and commented. love your blog and facebook! I like Go Go Natural and left new follower love on FB (Kimberlie Smith Tiegen). 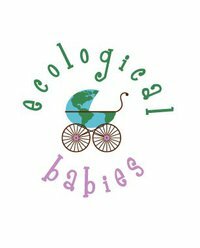 I like ecological babies and left new follower love on FB (Kimberlie Smith Tiegen). I'd like to purchase an swaddlebees diaper from gogonatural. If i purchased something from gogonatural, it would be the bunGenius bottom cleaner 2.0 . I'd like to purchase an Thirsties cover from gogonatural. I follow KN on FB (Kimberlie Smith Tiegen). I'd like to purchase the Baby Bum Drops from economical babies website. ocean blue duo diaper form ecological babies. I liked Go Go Natural on FB and wrote on their wall. I like Ecological Babies on FB and wrote on their wall. I'd like to get the BumGenius Diaper sprayer from Go Go Natural. I'd like to get the Maya Wrap from Ecological Babies. I'm already a fan of Go Go Natural! I "liked" Ecological Babies on FB! I'd like to try a Planet Wise Wet Bag in the Black Curly Q print from Go Go Natural! I'd like to try a BumGenius All in One 3.0 from Ecological Babies! I follow GoGoNatural on FaceBook and commented on their wall. I follow Ecological Babies on FaceBook and commented on their wall. I'd love to purchase a Rumparooz G2 diaper from GoGoNatural! I've love to purchase some Rockin' Green from Ecological Babies. I follow Knickernappies on facebook. I would love to try a flip diaper cover from go go natural. I Follow GoGoNatural on FaceBook and commented on their wall! I Follow Ecological Babies on FaceBook and commented on their wall! I'd love to buy the Starbunz Diaper Cover - Pink Puppy from gogonatural! Sooooo cute! i'd like athe chest rub from ecological babies; could come in handy this winter. I would also like to have the Babykicks Hemp prefolds from GoGoNatural. I would also like the bumGenius Diaper Sprayer from Ecological Babies. I'd like to try some RLR from go go natural. I follow GoGoNatural on FaceBook and commented. I'd like to get a Thirsties Duo Diaper from Go Go Natural. Fan of Knickernappies on FaceBook. I'd like to get a GroVia™ All-In-One from Ecological Babies. I thanked, linked and tagged on fb! I fanned go go natural and said hey! Fanned ecological babies and said hi!